I'll show you an affiliate program that will blow the socks off anything you've ever seen before. 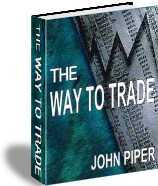 Regardless of whether you've purchased The Way To Trade or not, you can make money from this revolutionary trading e-book. You can recommend it to friends and colleagues using a simple link in an e-mail or, if you have your own web-site, you can place a link to us on your site. You will soon discover the five golden reasons why this affiliate program - your affiliate program - is one of the best available anywhere on the net...including how we've banished affiliate link hijacking forever, to protect your rightful commissions. There is a question and answer section below. First let's get going with those five reasons. Every time someone clicks on your your e-mail or web-site link, comes to our site and then orders , you will receive 50% of each e-Book sold - that's up to $27.23 net profit per sale for you! And they don't have to order immediately for you to profit. We track the visitor for a minimum of 90 days after you send them to us and if they place an order during this time, then you are credited in full. But there's more to it than that. On order page we up-sell by offering the customer a chance to subscribe to The Technical Trader Hotsheet at a reduced rate. we offer subscriptions for 3 months, 6 months or 12 months... and you receive 50% of that also. You could receive up to a massive $100.76 net profit per sale! 1. No visible nickname. They can look for as long as they wish, but it isn't there. 2. No awkward looking question marks (? ), equal signs(=), hops or skips. 3. Your personal web page URL does not look like an affiliate link. As more people become "net-wise", prospects are now much less likely to click a link that looks like an affiliate link. You don't have that problem anymore. In fact your own page name looks just like any other regular URL. Now listen up because this is the killer: your own page on our site means we've banished affiliate link hijacking forever and you have three levels of protection from theft of your rightful commissions. Level 1 hijackers: No-one can see your nickname in your links, so they can't simply replace it with their own. Level 2 hijackers: Once at our site, the address bar does not show your affiliate link or nickname anywhere. Almost everyone will be unaware you have sent them to the site through an affiliate link. They will not know where to find your affiliate nickname to replace it with their own. Level 3 hijackers: No one can "stop" the browser and see the source code for your personal page so they can't simply copy the code and replace it with their own affiliate link. Full compatibility with all browsers. Internet Explorer, Netscape, Opera any of the others, no matter what the version. Whether they have Java switched on or off, it doesn't make a difference, you'll still get the credit. Instant processing. From the customer's point of view, there's no waiting around whilst the browser loads all kinds of fancy functions or scripts. The whole process is so fast, the customer hits your page, is tagged with your affiliate ID and opens our home page in a flash, before they have any idea what just happened. Usually, when a customer is referred to another site, they are tagged with the referrers affiliate ID for a maximum of 90 days and if the customer orders before the 90 days is up you are still credited in full for the sale. However, send them to us through your own page on our site and instead of the standard 90 days, they are tagged for life with your affiliate ID by our systems. Once they place an order, or even if they only register for our free mini-course, every time we send them an e-mail their ordering links are laced with your affiliate pages. There's no escape!! Because we tag your customer for life with your affiliate ID, you receive a commission each and every time they order one of our range of new and expanding products. And this happens without you having to lift another finger to contact the customer, it's all done automatically. It gets better...this also means that if one of the products they order is The Technical Trader Hotsheet, you will receive regular and recurring commissions each and every time they renew their subscription. This could mean up to another $82.29 profit per year for you, with no additional effort. This affiliate program wipes the floor with any other available anywhere. Each and every paying customer you send to us could be worth hundreds of dollars to you over their lifetime. We believe we have the best affiliate program to match the best trading e-book available on the net. This affiliate program was designed entirely for you. Here at The Way To Trade, we believe the rightful referrer should be credited for every single sale. As you have just seen, we have taken every possible step to make that happen. All you need to do is register below and then take shelter as the stampede of commissions come romping home. Remember, 3, 4 and 5 above are only available if you register with our affiliate system below. If you send customers through the standard affiliate hop-link you lose any future commissions for good ...and why on earth would you want to do that? Question. Why such a high commission rate? Answer. We want to help as many traders as possible with the information in The Way To Trade. However, there are not enough hours in a day for us to reach all the millions of traders in need of the valuable information contained in The Way To Trade. Therefore, we are more than happy to share the profits when you help to spread the word. In the spirit of a true partnership, we believe that a 50% share is a fair and deserved reward for your efforts. Question. Do I have to pay to join the affiliate program? Answer. It is totally free to join this affiliate program. Answer. An independent company called Clickbank handles the sales processing and payment to affiliates. Click here to find out more about what Clickbank does. To join The Way To Trade affiliate program, first you will need to register with Clickbank and this is also free to do. Question. When do I get paid? Answer. Clickbank sends out checks twice a month, once there is a minimum of $25 in your account (this means that you could receive a check after the first sale of The Way To Trade from your site or your e-mail). Clickbank has an online statistics facility with real time updates, so you can see how much commission you have earned at any time. The best thing to do is take a tour of the Clickbank site once you register. Question. If I register with Clickbank and your affiliate program, will I receive hundreds of unwanted e-mails? Answer. In all the time I've been with Clickbank, I've never had an e-mail from them other than the very welcome automated confirmation of a referred sale. Here at The Way To Trade, we only contact you with information about new products or new promotional material when available. Therefore, please do not be concerned that your inbox will be swamped with unwanted and unnecessary e-mails - it won't happen. Question. Does your affiliate system bypass Clickbank? Answer. Our affiliate system is run entirely through Clickbank but we have added custom written functions unique to our site. These additions are designed purely to help protect the interests of our affiliates to ensure they are deservedly credited for all their referrals. Question. Do I need to order The Way To Trade to become an affiliate? Question. Do I have to register as an affiliate to receive my own page? Answer. Yes. Your own page on our site is automatically allocated as soon as you register below. Don't forget, by registering you also receive three levels of protection from affiliate link hijackers, lifetime tagging of your customers with your affiliate id and recurring commissions. Question. How do I get started? 1. Click here to register with Clickbank for free. (This opens in a new browser screen. Please switch back to this screen when completed!). Once your Clickbank account is open, it is important to remember the nickname you have assigned yourself. Click here to find out more about what Clickbank does. In the best interests of our affiliates, we deactivate the license to block access to the product for anyone who either orders through their own affiliate link or requests a refund. By registering with our affiliate system, you are able to check in real time the number of hits and sales through referrals from your site or your e-mails (see Affiliate Support below). It will also enable us to contact you quickly so you will be the first to hear about our new products coming in the next few weeks. Be sure to read the terms and conditions. By reselling The Way To Trade you are agreeing to the terms and conditions. Click here to check your affiliate stats, change your affiliate details, or to be e-mailed your affiliate password.